We posted the organizer's and GC leader Simon Yates' Mitchelton-Scott team's reports with the stage results. Elia Viviani became the first Italian in 12 years to land four stage victories at a single edition of the Giro d'Italia after another marvelous display of power, intelligence and well-crafted strategy of the Quick-Step Floors team in Iseo, a finish for just the third time in history, after 1973 and 1974. His amazing feat allowed the 29-year-old to further distance the competition in the cyclamen jersey classification, with 58 points separating now Viviani from his closest opponent with one flat stage left on tap. "Saba was amazing today, he kept me out of the headwind until with 200 meters to go and all I had to do from that point was open my sprint after Van Poppel tried to anticipate me. I had good legs, but what really made the difference was the selfless work of my extraordinary teammates. They deserve the credit for this fourth win, which gives me huge joy", a happy Elia said at the press conference. Elia Viviani wins in the rain. "I was a bit nervous before the stage, because I knew that Bennett was favoured by that climb in the beginning, but the boys kept everything under control. Increasing my lead in the points classification is the cherry on the top, as the cyclamen jersey is an important goal and I hope to keep it until Rome. Sunday puts an end to what's been a very competitive first part of the season for me and I hope to end it on a high note", said Elia Viviani, the fourth different Quick-Step Floors riders to take minimum four stages in a Grand Tour in the past 12 months. The 17th stage of the Giro d’Italia saw high speeds and several attempts right from the start. BORA – hansgrohe worked perfectly together to neutralize lots of attacks in a thrilling finale. 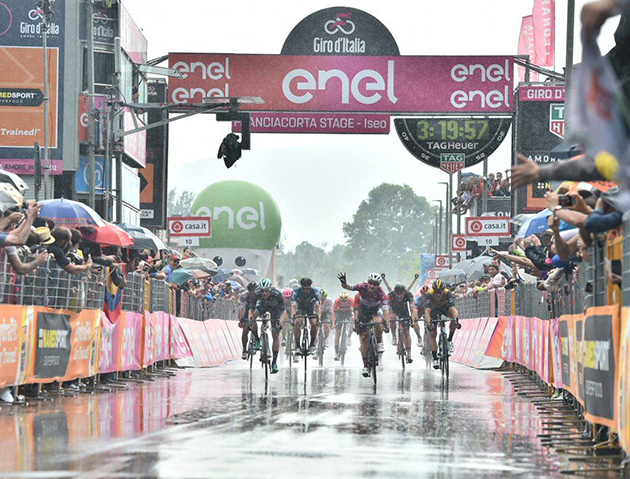 Under pouring rain the race headed into the last kilometres as Sam Bennett had to go for a long sprint to finish in a strong second place behind E. Viviani in Iseo. Directly after the start in Riva del Garda the course went uphill, after the categorised climb “Lodrino”, a technical descent awaited the peloton. The route continued with several sharp bends through small cities on the way to the finish in Iseo. After 155km of racing the riders faced on narrow roads the final demanding circuit before the crossed the finish line of stage 17. BORA – hansgrohe went in today’s stage with two plans, even to go in a breakaway and try to win the stage out of a group or to support Sam Bennett, when it will come to another bunch sprint. It was another frantic start to the stage as a big group of 14 riders built today’s breakaway with a small gap to the Maglia Rosa group including all BORA – hansgrohe riders. When the German squad pulled in the bunch, the break was caught, and the peloton split into two. The race never really settled, therefore a reduced bunch headed into the final circuit. As two riders launched an attack, Cesare Bendetti bridge the gap to take control again. With 2km remaining the excepted bunch sprint was set up, and Sam Bennett saw himself in 10thposition. The fast men started their sprint and Sam Bennett had to go for a long one. 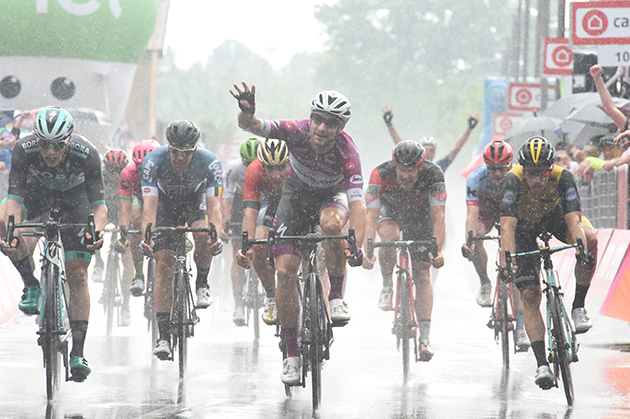 Under pouring rain, the BORA – hansgrohe sprinter finished in a strong second place, only E. Viviani kept his lead to take the stage win in Iseo. Sam Bennett was second in the sprint. No team was happy with the make-up of any group that went clear at stage 17, with each move throughout the day chased down. As the stage progressed the peloton showed no sign of relenting, bringing each attempt back from kilometre zero until three kilometres to go. The high pace coupled with the rolling terrain saw the peloton split multiple times throughout the day, but things would eventually come back together. The final breakaway attempt, and the only group that were given slight freedom from the peloton, were brought back in time for a bunch sprint to the line. After the team brought Tom safely into the final kilometres, he finished the day to remain 2nd overall at 56 seconds. 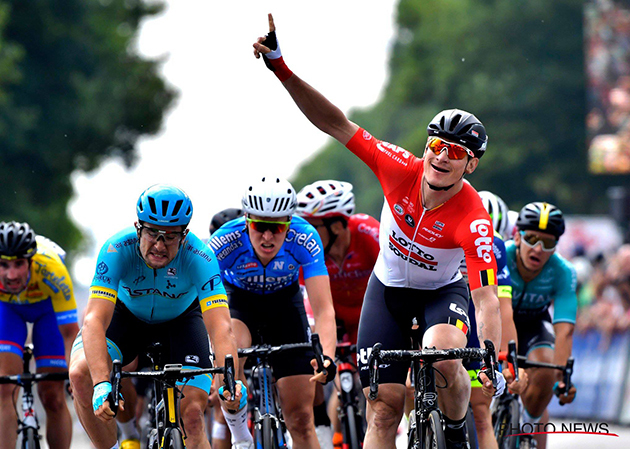 We posted the report from stage winner André Greipel's Lotto-Soudal team with the race results. André Greipel takes the first stage. - I was in the wheel of Magnus Cort when he crashed because of the risky roads in the final, and I was just able to stay on my bike. But Magnus was able to come back and the team did a great lead-out for me, so I was in a good position, just behind André Greipel. But when he started to sprint I could hardly get out of his wheel, as he performed a very strong sprint. It’s not a shame to lose a sprint from him, but I was very close today,- said Riccardo Minali after the finish. The riders took off from Buggenhout, to finish in the same city after 178.8 kilometers. A flat stage profile, so it was clear that it would be a day for the sprinters. A group of 6 riders were in the day’s breakaway, but they got caught before going in the final part of the race. In this final it was Magnus Cort who crashed, but without serious injuries, and within a few minutes he was back in the peloton to help preparing the sprint for Riccardo Minali. The young Italian sprinter got the perfect lead-out of the team, bringing him straight in the wheel of André Greipel. But the German pulled off a very strong sprint, as Minali was able to come out of his wheel, but not to overtake him in the final meters. Tomorrow’s stage will be another chance for the sprinters, as the peloton will race 162.1 kilometers from Lochristi to Knokke-Heist. Riccardo Minali will start in the red leaders jersey for the Points Classification, as André Greipel is already wearing the blue overall leaders jersey.